David will be in attendance. Rotofugi Gallery is pleased to present “Sutured and Untamed”, a solo exhibition that will include an impressive collection of 17 collage/mixed media works on hand built wood panel by San Francisco-based artist, David Ball. In this latest series of work, Ball depicts the pursuit of happiness through a visual narrative that reflects on his personal transcendence from a place of emotional darkness to a place of light. The opening reception for Sutured and Untamed will be held at Rotofugi Gallery on June 29, 2012 from 7pm til 10pm and will coincide with Jesse Reno’s exhibit in Rotofugi’s other gallery entitled: “Wolves Tails Crossed Arrows and Canoes”. David Ball’s practice evolves from a place of continual change, embracing the chaos to achieve a sense of order. His process begins roughly, with quick, abstract and gestural under paintings that gradually evolve into an elaborate and well-defined composition through the artist’s “call-and-response” style of working. Ball’s personal life greatly informs his process and the themes behind his imagery. Throughout his life, he experienced a series of extreme shifts in his psycho-emotional state of being that took him through periods of emotional highs which inevitably turned to lows that resulted in paranoia, aggression and depression. His willingness to transcend the chaos saved his life and was due in part to being open to taking medication and in part due to his personal resolve to trust in the love and kindness of someone close to him. While Ball’s earlier work was darker, more brooding and discussed themes of conflict without much concern for resolution, the changes he’s made in his personal life have crossed over to his creative life. Ball’s latest work seeks to engage the viewer in a discourse that he hopes conveys joy and inspiration. 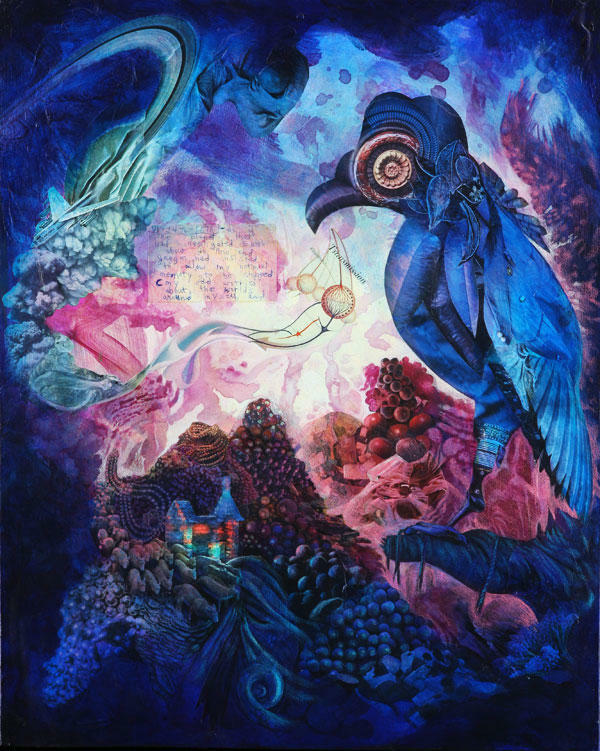 The work for Sutured and Untamed celebrates color and character through vibrant layers of acrylic paint, colored pencil and collage that unite to form otherworldly scenes of mythical creatures and fantastically surreal landscapes that invite viewers to share in the artist’s wonder and fascination at the human pursuit of happiness. This entry was posted in Openings and Events and tagged art, Chicago, Rotofugi Gallery. Bookmark the permalink. At first I wondered about the titling “Sutured and Untamed” since at first I didn’t see how something bound by stitching could be free or untamed. But, it also means to unite so I guess it is the unity of media to convey a theme. I was curious as to your reasons. But, it is provoking and that is probably enough. I like the bird; it has a phoenix feel to it.